Happy Mother’s Day. Where would we be without mothers (existential and rhetorical question) ? The biggest news here is that the revised books are available in Kindle format. 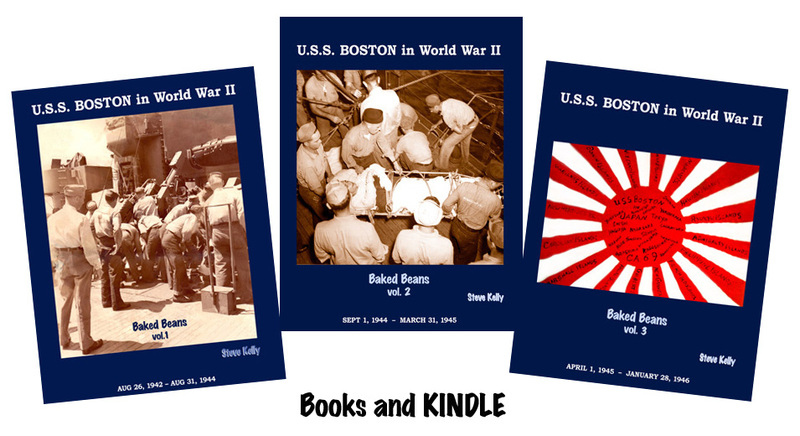 Books are all priced $14.95 each (all 3 for $40.95 and free shipping when purchased through the website – same as before). For anyone who wants to “upgrade” but has already purchased books – I’ll be happy to send you new ones at my cost and shipping. Email me at steve@kellys.org. There are folks out there who have helped me by sharing photos, documents, etc that I have used in the books – sit tight, I’ll be getting back to you with complimentary copies. ANYONE who has purchased Baked Beans books through either Amazon or my website in the last month or so, contact me and I’ll replace them. A few copies slipped through the cracks in draft mode – not quite final-edited. OOPS. My dad served on the Boston during WII. I’d love to purchase these books. How do I go about ordering them? My dad was Alfred Henderson of Brewer, Maine. He was a gunners mate.